This is the beginning of a multi-part blog that I plan to write over the next few weeks. I was telling my colleague that the condo I live in is going on the market and so I need to clear out my stuff to get it ready for showings then pack up my stuff and get ready to move once it sells. It is complicated that I will be living in the condo while it is being shown. I have to clear out a lot of stuff just to get it ready for the condo to be shown. As I am affected by ADHD you can make the assumption that my place is a mess. I won’t be offended. I am also a packrat. 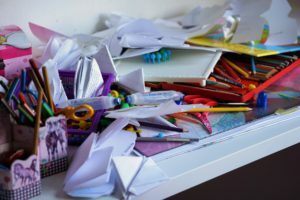 My colleague had the idea to share my experiences of getting organized, de-cluttered, staged and ultimately packed up. When I realized that all this was going to happen and quickly I started to panic a little. Then I reminded myself that like many with ADHD, I am usually good in a crisis. And this feels like a crisis because of the timing. We want to get the condo on the market quickly because the closer to the holidays the market slows down. That makes sense but the fact that as I write this it is the first week of October means time is limited. I have lived for 10 years in this condo so I have accumulated a lot of stuff to sort through. One of my first actions was to do a little research about showing a place and it made me realize two things. First a lot of my stuff needs to be moved out for the condo to show well. Second that it would be a trap to spend too much time researching and not taking action quickly. All this is further complicated by the fact that I am in a two bedroom and plan to move to a one bedroom. Not only does a lot need to be packed up. A lot needs to be donated, sold and tossed. All this takes time and organizational skills – both of which I in short supply of. My colleague I mentioned earlier gave me a tip, actually more of a reminder – forget perfect. That is the title of a book I wrote in 2015 about living with ADHD, “Forget Perfect: How to Succeed in Your Profession and Personal Life Even if You Have ADHD,” https://abigailwurf.com/writing/. Unfortunately the book doesn’t cover moving. It is an important tip – forget perfect – because many of us affected by ADHD get caught up in creating systems to do things that are more complicated than they need to be. We spend too much time working out the perfect system and then not enough time taking action. Just like I could have gotten caught up in researching about all I have to do when a little research goes a long way and taking immediate action is most important. What needs to be sorted? What needs to be sold? What needs to be donated? What needs to be tossed? What needs to go into storage until I move? There is an additional list I have made and that is of all the different categories of items that all this has to happen to. Such as clothing, books, paper work, art supplies, kitchen items, etc. This way like things will stay grouped together and organized. This will help make unpacking easier. Also as I finish each category I can cross it off my list. The sorting takes place first because it will inform what needs to be tossed, donated, sold and packed up. All of these lists will be modified as I go along. They are works in progress. While I am doing all this I will need to find out how I will sell the items to be sold, where which items will be donated and where to toss all the discarded items that can’t be donated or sold. Also I will need to find temporary storage for the items that I decide to keep but are too much clutter to keep in the condo while it is being shown. I think the key is to have a plan but not get too caught in creating the perfect plan because that takes too much time and doesn’t get things happening quickly enough. We often get caught up in how we are going to do something and never end up actually doing it.